Abstract Mayor of San Francisco Art Agnos (1988–1991) ordered the arrest of Food Not Bombs activists for distributing food without a permit in August 1988. A campaign of arrests and harassment continued throughout Agnos’s administration as he and the activists continually butted heads over the City’s homelessness politics. Central to this conflict was the role of permits in regulating public space and Food Not Bombs’ refusal to accept the City’s legitimacy in limiting public meals. This article contends that Agnos used health and parks permits to force “negotiated management” between Food Not Bombs activists and police and City officials in order to regulate their public meals of the homeless in order to moderate the group’s politics and remove them from contested public space. Food Not Bombs refused this negotiated management and instead occupied public space and provided free meals daily. In response, the City and Mayor Art Agnos used police to exclude the group from public space in an attempt to force the group to negotiate. Expanding on Margaret Kohn’s theoretical work on political space by examining the role of autonomous claims in public space occupations, this case highlights the dialectical way that different conceptions of space— sovereigntist, representational populist, and autonomous populist—can come into conflict and open up new political opportunities to make marginalized voices audible, hidden bodies visible, and state coercive power apparent. 1 There once were real benches in the park but Mayor Willie Brown decided to remove them as a way to force the homeless from the plaza through environmental engineering. Without benches most people—homeless and not—have to find concrete ledges or the moist grass to sit on.without police conflict.2 The closest the group comes to a police interaction is when a “sergeant” with the local Salvation Army, dressed in military-style attire, asks the food servers to what church they belong. The sergeant walks away dumbfounded when the servers express that they are not with any church but are serving food as a protest to militarism, gentrification, and the City’s hostility toward the homeless. For this article, I conducted twelve semi-structured formal and informal interviews with Food Not Bombs activists and local members of San Francisco’s homeless activist community over two three-week periods in April 2010 and June 2011. I also examined the Art Agnos paper archives at the San Francisco Public Library and compiled newspapers, journals, and activist magazines to examine how the Art Agnos mayoral administration maintained control over public space through the use of food, health, and park permits. The Agnos administration used these permits as a means of forcing Food Not Bombs into what criminologists have called “negotiated management,” a policing procedure that creates formal and informal ties between police and protest groups.4 Negotiated management aims to include the protest group within the institutional structures of the state– charity nexus and, thereby, moderate the group’s activism and regulate their political practices in public spaces. 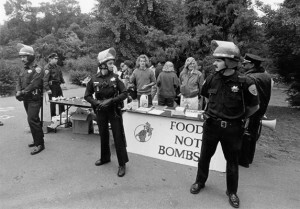 2 The last time the police in San Francisco harassed Food Not Bombs was a few months before the 2000 mayoral election. According to longtime Food Not Bombs activist Chris Crass, the public outcry in the City was enormous and within a day all charges were dropped. 3 The fountain has since been removed, and signs are posted throughout the Civic Center noting, “distributing food without a permit is forbidden.” Both the fountain removal and the placing of the signs were done in response to the actions of Food Not Bombs. 4 Clark McPhail, David Schweingruber, and John McCarthy, “Policing Protest in the United States: 1960–1995,” in Donatella Della Porta and Herbert Reiter (eds), Policing Protest: The Control of Mass Demonstrations in Western Democracies (Minneapolis, MN: University of Minnesota Press, 1998), pp. 49–69. 5 Patrick Gillham and John Noakes, ‘“More Than a March in a Circle’: Transgressive Protests and the Limits of Negotiated Management,” Mobilization: An International Quarterly 12:4 (2007), pp. 341–357. The democratic potential of public space makes it a powerful force for emancipatory politics and a dangerous locus of disorder and violence. Benjamin Shepard and Greg Smithsimon express this idea in their examination of Dolores Park in San Francisco, highlighting the fact that “in this compressed, urban park only a couple blocks long, there is a marvelous integration of different users of the space, but simultaneously firm self-segregation as well.”7 What makes Dolores Park exciting and powerful for Shepard and Smithsimon is the fact that the control and regulation of the space “…is not emanating from the squad car. Order in public space is generated primarily, though not exclusively in this case, by the users.”8 While, of course, Dolores Park is regulated by the City of San Francisco and monitored by the San Francisco police, these authors correctly assert that the day-to-day politics of Dolores Park is regulated not by City code, but by the parks’ users. Basketball players negotiate the space with families playing on swings, tourists taking vacation photos, and City residents relaxing on the grass eating lunch. Why does the democratic nature of this space matter? 6See, for instance Patrick Gillham, Bob Edwards and John Noakes, “Strategic Incapacitation and the Policing of Occupy Wall Street Protests in New York City, 2011,” Policing and Society: An International Journal of Research and Policy 21:1 (2013), pp. 81–102. 7 Benjamin Shepard and Greg Smithsimon, The Beach Beneath the Streets: Contesting New York City’s Public Spaces (New York City: State University of New York Press, 2011), p. 5. The relationship between public space and citizen involvement is, however, complex, especially for the homeless because, as Leonard Feldman states, the homeless serve as one of the “others” used to define citizenship in a liberal democracy.11 Liberal citizenship, for Feldman, directly connects with the public/ private divide in that to be a full citizen in a liberal society, one is required to have a private space to which they can return. The political inclusion problem for the homeless then, according to Feldman, has nothing to do with their invisibility, but with their hyper-visibility because they have no way of escaping the public eye. Tony Sparks who, in looking at homelessness policy in King County, Washington, notes how City officials discounted the voices and opinions of the homeless because they were, de facto, defined as being unable to manage their own lives and thus need their lives managed for them. “Today’s homeless are caught in a double-bind wherein they must choose between pathologization and criminaliza- tion as a condition of basic survival,” Sparks explains, “While the latter aims at physical exclusion of bodies from public space, the former, in effect if not in intent, marks the exclusion of the homeless from full citizenship in the public sphere.”12 Simply by being homeless, a person is considered to lack the rationality, reason, and self-regulation required for liberal democratic involvement. What makes public space a potential location for political self-representation is not its visibility, because, as Feldman points out, that visibility is a justification for their political exclusion, but the potential for democratic engagement and participation that it allows. 9 Don Mitchell, “The End of Public Space? : People’s Park, Definitions of the Public, and Democracy,” Annuls of the Association of American Geographers 85:1 (1995), pp. 108–133. 10 Shepard and Smithsimon, The Beach Beneath the Streets. 11 Leonard Feldman, Citizens Without Shelter: Homelessness, Democracy and Political Exclusion (Cornell, NY: Cornell University Press, 2006). 12 Tony Sparks, “Governing the Homeless in an Age of Compassion: Homelessness, Citizenship, and the 10-year Plan to End Homelessness in King County Washington,” Antipode 44:4 (2012), p. 1518.
conflict occurs because “the inherently contested nature of public space reveals that it is never free from the risk of disorder, an observation that places democracy in conflict with the need for ‘order’ so that the capital should flow smoothly.”13 This struggle between democratic vibrancy and sovereign order is central to Margaret Kohn’s typology that divides space into the two categories of sovereign and populist space.14 Kohn’s conception of space, I argue, does not capture the significance of a third type of space—autonomous populist space – that represents a militant counter to non-autonomous populist space that I identify as representative populist space. 13 “Public Space as Emancipation: Meditations on Anarchism, Radical Democracy, Neoliberalism and Violence,” Antipode 43:2 (2010), pp. 526, 528. 14 “Privatization and Protest: Occupy Wall Street, Occupy Toronto, and the Occupation of Public Space,” Perspective on Politics 11:1 (2013), pp. 99–110. 16 Don Mitchell, “The End of Public Space? : People’s Park, Definitions of the Public, and Democracy,” Annuls of the Association of American Geographers 85:1 (1995), p. 115. 17 Margaret Kohn, “Privatization and Protest: Occupy Wall Street, Occupy Toronto, and the Occupation of Public Space,” Perspective on Politics 11:1 (2013), p. 101. In effect, the sovereign view in most US cities means that the state orders public space for the benefit of economic interests and not for public good or resident use. The contemporary sovereign view pushes the City to develop as a sanitized City preferred by tourists, wealthy residents, and corporate interests. There are many examples of protests against the consumer city such as those by anti-gentrification activists against Google buses in San Francisco. These activists assert that San Francisco has embraced the tech-industry and transformed the City in a way that excludes poor, working class, and immigrant communities. Protests like this show a substantial resistance to the sovereign conception of the City, and to corporate controlled public space more generally. The tension between democratic and top- down understandings of space regularly leads to conflicts and contention. Margaret Kohn and Don Mitchell, amongst others, have noted that the restrictive vision of sovereign space often provides an impetus for oppositional movements such as Food Not Bombs. To participants in resistance movements, reclaiming public space allows for contesting the political exclusions that plague the political system. When the order of sovereign space breaks down, what erupts is, according to Kohn, “populist” space that “signals the political mobilization of the people outside the institutional structures of the state.”20 This conception of space is collectively constructed and extra-parliamentary; “because aggrieved citizens can express the intensity of their discontent through protest and non-compliance, the government is forced to negotiate and compromise, thereby incorporating the people’s desires into the law.”21 In effect, to Kohn, populist space exists whenever a power from below reclaims public space and turns that space into a form of what Don Mitchell calls representational space. The defining feature of populist space then is its ability to make visible the excluded views and perspectives of the populace. An example of populist space is described in Mitchell’s work on the protests over Berkeley, California’s People’s Park. He asserts that the protests forced the University administrators and City officials to include the homeless in their political calculations and pressured the City to engage in negotiation with the activists in the park. While not all populist claims to space are the same, there is a fundamental difference between anarchistic occupations of a park and permitted rallies on a street corner. 20 “Privatization and Protest,” Perspective on Politics 11:1 (2013), p. 102.
management as Survival,” Progress in Human Geography 30:6 (2006), p. 1. While to many this autonomous desire might be seen as utopian and inherently problematic—echoing Simon Springer’s reminder that democratically controlled public space is always on the precipice of disorder—it is an essential component of anarchist and radical homelessness politics. The desire for self-management is central to contemporary from traditional representational populist space, which is not inherently anti- capitalist or democratic, merely dissident. Autonomous populist space rejects the state’s authority to monopolize control over public space and is thus a direct refusal of the logic inherent in the sovereign definition of space. An autonomous view of space, unlike the representational populist conception, is not primarily concerned with appealing to governing elites, but in generating non-hierarchical, non-capitalist, user-based democratic spaces that serve as a counter institution to the state. Occupy Wall Street, for these reasons, created counter-institutions such as peoples’ assemblies, free schools, free libraries, and free medical clinics that represented anarchistic public space occupations as experiments in direct democracy. While political claims or demands are made during such occupations, the goal is not to get a seat at the decision table, but to reject the idea that decisions should be made behind closed doors. Overall then, autonomous claims should not be seen as separate from populist space. Because autonomous politics embraces the anarchist idea of “propaganda by the deed,” these actions are meant to represent the anarchist vision and while utopian, they also are intended to communicate the needs, wants, and demands, of the people involved. In order to account for these additional dynamics of public space, a third category needs to be added to Kohn’s typology to include sovereigntist, representational populist, and autonomous populist. anarchist politics, as seen by contemporary anarchism’s push for participatory workplaces, direct democratic political organizing, and cooperative living. 24 John McCarthy and Clark McPhail, “The Institutionalization of Protest in the United States,” in Sidney Tarrow (ed.) The Social Movement Society: Contentious Politics for a New Century (Boulder, CO: Rowman and Littlefield, 1997), pp. 83–110. 25 Policing Dissent: Social Control and the Anti-Globalization Movement (New Brunswick, NJ: Rutgers University Press, 2008), p, 13.
disruption to social, political, and economic sites. Negotiated management seeks to incorporate and institutionalize protesters as a way to pacify and regulate them. In effect, negotiated management is a form of interaction between protesters and the state that does not question the unequal power relations between the two sides. When protesters negotiate on the state’s terms, they do so from a very disadvantaged position because they lack political leverage with which to pressure the state. Instead of being fair and equal negotiations in which the protest movement makes demands of the state, this situation is more commonly defined by protest movements conceding to the demands and interests of the state for fear of government repression. I argue that successful autonomous populist movements threaten the state and, therefore, when they negotiate or interact with the state, they do so from a better political position and, therefore, can make strong political demands. Now, we turn to how San Francisco Food Not Bombs, an autonomous political movement, conflicted with the Art Agnos administration in San Francisco. This narrative highlights three issues: the role of permits and negotiated management by the City as an attempt to control and regulate public space, the power of autonomous movements to open up political space that would otherwise be closed, and the political impact of contested space on local urban politics. 26 Left Coast City: Progressive Politics in San Francisco 1975–1991 (Wichita: University of Kansas Press, 1992), p. 91. 27 Sharon Zukin, “Gentrification: Culture and Capital in the Urban Core,” Annual Review of Sociology 13 (1987), pp. 129–147. 28 Chester Hartman and Sarah Carnochan, City for Sale: The Transformation of San Francisco (Berkeley, CA: University of California Press, 2002), p. 368. Agnos, as Richard DeLeon suggests, had neither the patience nor the power to enact his progressive agenda, pursuing instead “the path of least resistance.”33 Instead of listening to and working with the City’s grass-roots sectors as promised, Agnos continued Feinstein’s neoliberal development policies and gentrification projects. Presuming that urban development easily created jobs and increased revenue to the City, Agnos abandoned his platform of neighborhood and community diversity and respect, as well as his promises to reform the City’s homelessness policies. This led to Agnos being viewed “as a bait-and-switch political con artist who got himself elected as a slow-growth progressive but then governed the City as a pro-growth liberal.”34 Agnos saw his coalition fall apart as two members of his former coalition ran against him in 1991, and neither candidate endorsed him in his run-off election against conservative Democrat Frank Jordan. Progressives in San Francisco saw Jordan, the former police chief running as a pro-business, pro-development candidate, as no worse than their former “golden boy” Art Agnos. order to build a new business center and shopping area. During the 1970s these plans were front and center in the struggle over gentrification in the City. 30 Hartman and Carnochan, City for Sale, p. 256. 31 Quoted from Ibid, p. 257. 32 Hartman and Carnochan. City for Sale, p. 378. 33 Left Coast City, p. 159. Food Not Bombs emerged from the Coalition for Direct Action at Seabrook, an anti-nuclear peace group. Food Not Bombs’ first action was to organize a mock 1930s soup kitchen in front of the First National Bank of Boston shareholders’ meeting to protest the bank’s support for nuclear power on the East Coast. The mock soup kitchen became a real soup kitchen when at least fifty homeless and hungry people stopped by for food and joined in on the protest. From that point on, the group collected distressed food daily and provided it to Rose’s Place, a battered women’s shelter, as well as to drug rehab clinics, homeless service groups, immigrant rights organizations, and other progressive and left-wing service organizations. Every Monday in Harvard Square, they would provide a vegan meal for all who were hungry, while also distributing literature about military interventions, nuclear weapons, and social and military policy.35 The group has expanded quickly since their founding in 1980 and currently has over 400 chapters located on every continent except Antarctica. The San Francisco chapter of Food Not Bombs started in December 1987 when Keith McHenry, the co-founder of Food Not Bombs and a recent e ́migre ́ to San Francisco from Boston, organized a Food Not Bombs meal near Golden Gate Park with help from the Haight Ashbury Neighborhood Council. The meals consisted largely of rice, beans, and bread, served from plastic buckets into makeshift bowls and cups. 35 This founding story is detailed in K. McHenry and C. T. L. Butler, “The 25th Anniversary of Food Not Bombs,” found at www.foodnotbombs.net/anniversary.html, and Keith McHenry and C. T. Butler, Food Not Bombs: How to Feed the Hungry and Build Community (Philadelphia, PA: New Society Publishers, 1992). 36 Through interviews I conducted with some of the early organizers, I learned that applying for the permit was a contentious issue that many in the group did not want to do; however, no one at the time thought that it was going to be an issue as far as the City was concerned. 37 Internal memos found in Art Agnos archives show that his administration was aware of the Cole Valley Association and had read their grievances with Food Not Bombs and responded. 38 This is the first time in Food Not Bombs’ history that activists were arrested for distributing food. This became a sign of things to come, as many cities during the 1990s and 2000s have targeted Food Not Bombs activists for arrest. The antagonism between the City and the group came to a head within a month when, on Labor Day 1988, 200 hungry and homeless people went to Golden Gate Park in search of a hot meal while fifty-four activists from Food Not Bombs, surrounded by riot police, lined up to serve them food. The riot police counted twenty-five served meals, the legal number allowed by City law before breaking permit restrictions, and then began arresting people. The arrests proceeded like an assembly line: an activist would scoop a bowl of food and hand it to a hungry person and a police officer would then handcuff and arrest that activist. Echoing the spirit of the 1909 Wobblies’ free-speech fights in Spokane, Washington, the next activist in line to serve would take up the ladle and serve another bowl of food and would promptly be arrested by another police officer. This process continued until all fifty-four activists had been arrested. The arrests garnered national news attention from The New York Times, CNN, and other mainstream news outlets. After the Labor Day arrests, on September 8, 1988, the City claimed it would cease arresting the activists in exchange for Food Not Bombs agreeing to negotiate the location of free meals with the City. According to Bob Prentice, then City coordinator for homeless programs, the Mayor’s office did not “want to be in a position of arresting people because they’re giving good food to hungry people.”41 The City declared a “cease fire” from arrests when members of Food Not Bombs, the American Civil Liberties Union, the Police Department, and the City sat down to negotiate a solution to the problem. 39 Bill Gordon, “Volunteers Arrested at S.F. Food Giveaway,” San Francisco Chronicle (August 16, 1988), A3. 40 Internal Mayor Document titled “Sept. 6, 1988 re: Food Not Bombs Arrests” found in the Agnos Papers, San Francisco Public Library, p. 4 of 4. 41Bill Gordon “Debate Grows Over Food Vs. Politics” San Francisco Chronicle (September 1988) San Francisco: A3. “we must develop a policy for this kind of program, where people can be fed with dignity and in privacy.”42 Interestingly, Agnos seemed more concerned with the public aspect of the meals than with the health and safety issue, as noted in his insistence on “privacy.” This subtlety might explain why activist materials were confiscated and the food was donated to local churches. If the City was concerned about food safety in a public setting, why would they stipulate that unused food by Food Not Bombs be distributed through other charity groups in private? Though Food Not Bombs secured a temporary permit on September 10, 1988, the debate and politics surrounding a permanent permit continued (see Table 1). A few months after the first permit was issued, Parks and Recreations changed its laws regarding permitting. The public consultation to discuss the new permit requirements drew over 300 people, and the vast majority showed their support for Food Not Bombs. This turnout broke the attendance record for a Parks and Recreation meeting.43 The new permits law toughened the sanitation rules concerning tables, metal containers, and hand-washing stations. One of the reasons for the changing permit requirements might have to do with the fact that, according to the Mayor’s staff, “Rec-Park does not issue food distribution permits lightly because it does not want to encourage use of parks as homeless encampments.”44 Despite the stricter rules, the City gave Food Not Bombs a permit to provide meals at the corner of Stanyan and Page (the negotiated location) on September 11, 1989—almost a year after negotiations began. The permit was short lived. On June 28, 1989, Food Not Bombs organized a twenty-four hour soup kitchen for a tent City protest in Civic Center Park, right in front of City Hall. The three-week tent City became known as Camp Agnos, and embraced the slogan “We’re tired, we’re hungry, we don’t like the government.”45 Homeless activists protested the failure of the Agnos administration to address the issue of homelessness and affordable housing within the City. Unlike mainstream homeless organizations, Camp Agnos activists engaged in direct action, creating a public spectacle in front of City Hall. 42 Martin Halstuk, “Cease-Fire Declared in Free Food War,” San Francisco Chronicle (September 10, 1988), A3. 43 Sam Whitting, “Making Grub, Not War,” San Francisco Chronicle, (February 28,1989), B3-4. 44 Internal Mayor Document titled “Sept. 6, 1988 re: Food Not Bombs Arrests” found in the Agnos Papers, San Francisco Public Library, p. 4 of 4. 45 Richard Edmondson, Rising Up: Class Warfare in America From the Streets to the Airwaves (San Francisco, Librad Press, 2000), p. 48. Bombs Menu (their newsletter) and by including additional information gained through interviews and newspaper articles. Protesting Agnos’s failure to respond to the tent City occupants at the town hall meeting, the next day Food Not Bombs members occupied the Mayor’s office and demanded immediate action to help the City’s homeless. The office occupation angered the administration, and afterwards, Agnos refused to meet with any representative from Camp Agnos and began arresting tent City protestors generally, not only Food Not Bombs activists. By the end of the over three-week tent City occupation, approximately twenty people were arrested. 47 Kathy Bodovitz and Mona Miyasato, “Ban on Food Giveaway Upheld,” San Francisco Chronicle, (July 22, 1989), A3. accept forced inclusion and moderation of their politics. If the group accepted this inclusion, their voice would be moderated by newly imposed permit constraints, but if they did not, they would be forcibly excluded from public space, in effect restricting their ability to make their political views heard. Increasing the costs of acting was actually one of the proposed ways of addressing the group, according to an internal mayoral administration memo. In this memo, the anonymous author stated that the City should “use fines in conjunction with citations to put financial pressure on McHenry and Food Not Bombs” and “use the homeless network to isolate Food Not Bombs by stressing that agitation is destructive to the entire food distribution network.”48 This attempt, however, backfired for the City as the conflict with them and the group actually amplified their voice and exposed fissures within Agnos’s political coalition. 48 Internal Mayor Document titled “Sept. 6, 1988 re: Food Not Bombs Arrests” found in the Agnos Papers, San Francisco Public Library, p. 4 of 4. 49 Bill Gordon, “Free Food Again in the Haight,” San Francisco Chronicle (August 23, 1988), A5. 50 See Talmadge Wright, Out of Place: Homeless Mobilizations, Subcities, and Contested Landscapes (Albany, NY: State University of New York Press, 1997). 51 Bill Gordon, “Free Food Again in the Haight,” San Francisco Chronicle (August 23, 1988), A5. 53Bill Gordon, “Debate Grows Over Food Vs. Politics,” San Francisco Chronicle (September 9, 1988), A3. 54 Sam Whitting, “Making Grub, Not War,” San Francisco Chronicle (February 28, 1989), B3-4. permit be necessary. We will never stop feeding people.”55 What Food Not Bombs actions came to highlight was the way that the City used permits intentionally to regulate the homeless community. 55 Clarence Johnson, “2 Civic Center Arrests—Crackdown on Free Soup,” San Francisco Chronicle (July 14, 1989), A2. 56 Bob Prentice, “Testimony on Civic Center Plaza Before Board of Supervisors Human Services Committee: July 18, 1989,” from the Art Agnos Papers collection, San Francisco Public Library. 58 Kathy Bodovitz, “Crowd Angry at City Move to Clear Plaza,” San Francisco Chronicle (July 12, 1989), A1. integrating the group within the permit apparatus of the state. This interaction highlights the way that permits are used to control and force radical movements into the regulatory confines of the state. The struggle between Food Not Bombs and the Agnos administration is about how sovereign and autonomous populist claims to public space clash. To address this conflict, the City of San Francisco attempted to negotiate a solution that maintains its sovereign claims over public space. As such, the purely representational components of the public park occupations were accepted by the City as it seemed interested in opening space for homeless voices to be included in the decision-making process. This is seen, not only by Agno’s willingness to negotiate and work with Food Not Bombs as long as they move from autonomous politics, but also by his willingness to negotiate and compromise with other homeless rights groups during the tent City. In both of these examples, the administration responded to the occupations by constructing a solution that expanded inclusion in exchange for groups giving up their more radical positions. The narrative described in this article also highlights the confrontational nature of autonomous claims to space. The public meals and tent cities organized by Food Not Bombs empowered subaltern figures in San Francisco life, most notably the homeless and urban poor, by creating autonomous spaces that allowed homeless activists to engage democratically with one another. These spaces not only made the homeless visible, but also empowered them to develop and deliver demands. This different form of empowerment can occur through political inclusion and symbolic protest. In addition, the struggle between Food Not Bombs on one side and Agnos and the police on the other underscores how intensified forms of control and regulation in public space become increasingly important for municipal governments to silence political dissent and depoliticize the poor and margin- alized. Austerity economics and the securitization of public space exclude and silence the poor and marginalized members of our society. Public space, as a result, is increasingly the site of contestation because occupying public spaces makes people not only visible but politically empowered. As more space becomes enclosed and privatized, the remaining public space becomes increasingly important for democratic politics, and as such the battles over these spaces will become intensified. The violent and excessive crackdown of New York City’s Occupy Wall Street protestors in November 2011 and Food Not Bombs activists in Orlando, Florida in July 2011 are examples of how City mayors and the political elites understand the fragility of neoliberal urban order. To repress such groups, cities use permits for health codes, noise ordinances, and parks to regulate and control radical social movements in public space. For groups that accept this form of government involvement, negotiated management means that their “how, where, and when” will be regulated in such a way as to limit their disruptive ability. Those groups that resist attempts at control and make autonomous claims in public spaces will most likely come into conflict with government institutions. political relationships and recast public space in a major US city. Food Not Bombs overcame the state’s attempts to forcibly include their group in the state–charity nexus and made visible the structural violence of poverty and homelessness in San Francisco. Because most middle class residents and visitors to the City did not want to be reminded of the destitute and poor, Food Not Bombs empowerment of them helped turn the homeless into political actors who pressured Agnos and other liberal/progressives in San Francisco through political mobilization and a politics of refusal. This, in effect, helped shatter Agnos’s already precariously built coalition. This article has argued that occupying public space and making autonomous demands can undermine the state’s intensification of class oppression by resisting the imposition of austerity economics, the further criminalization of the poor, and the privatization of public space. In the end, it was not just party mobilization, political lobbying, or well-crafted media campaigns that broke apart this coalition and changed San Francisco’s discourse on homelessness. It was about a small group of homelessness activists, making soup from discarded vegetables, and serving it for free in public space. I would like to thank the two editorial teams at New Political Science—Nancy Love, Mark Mattern, Jocelyn Boryczka, and Jennifer Disney—for their support in getting this article ready for publication, as well as the anonymous reviewers, whose editing and prodding have greatly improved this article. Without the input and editing work of Sway Olvera this article would still be, at best, a rough draft. The comments of Deborah Baumgold, Gerald Berk, Luis Fernandez, Lia Frederikson John Hultgren, Joe Lowndes, Joel Olson, and Abdurrahman Pasha helped turn my dissertation work into the current article. Finally, I want to thank the activists involved with San Francisco Food Not Bombs who through their tireless activism, dedication, and compassion have worked to make this world a much better place. Dr Sean Parson is an Assistant Professor in the Departments of Politics and International Affairs and Sustainable Communities at Northern Arizona University. He is finishing up a book manuscript titled Cooking up Revolution: Food not Bombs, Anarchist Homeless Activism and The Politics of Space and is currently working on a project that explores what superhero comics and movies tell us about our relationship with the more than human world. When not working or grading he spends his days hiking the mountains of Northern Arizona with his best four-legged friend, Diego.